Mercer Union is pleased to present the third part in the Spidersense series of six exhibitions curated by board members Reid Diamond and Evelyn Von Michalofski. For each Spidersense, a visual artist and a concrete poet engage in spatial activities: one artist in the project room and one artist featured in the brochure. 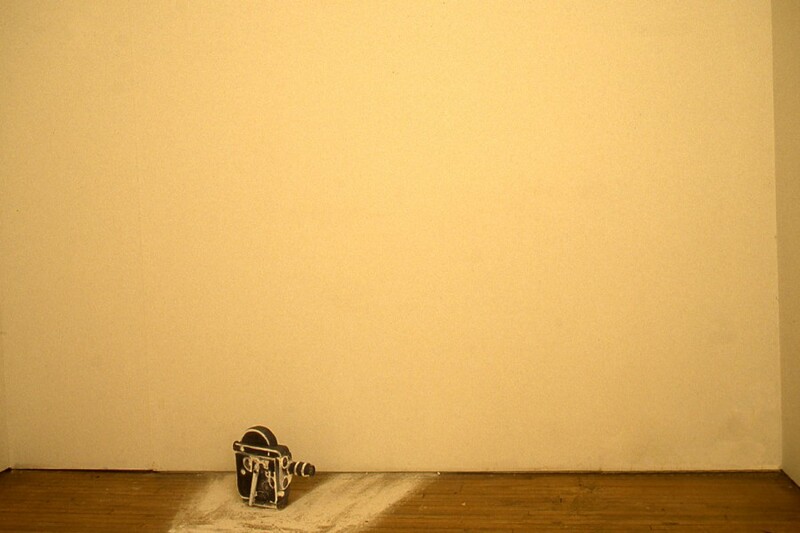 Murray Favro‘s Camera and Projector can be seen as a working model for the way in which visual language is projected and projects. 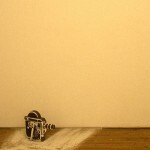 While the object on the floor appears to be a real Bolex film camera, it is in fact, only a wooden object receiving information from a projector. Like these words applied to the page you are looking at, all objects are inherently colourless and achieve the illusion of harbouring colourful hues and values, vis a vis the perceptions of the eye. While Favro’s motion picture camera first appears as a still life model, it is in fact, engaged in full action. An endless narrative. Etcetera, etcetera, etcetera. London-based artist Murray Favro has exhibited nationally and internationally, gaining a prominent reputation as a leading Canadian contemporary artist. In 1983/84 Favro had a retrospective of his work at the Art Gallery of Ontario which traveled to the Montreal Museum of Fine Arts, The National Gallery in Ottawa and the London Regional Gallery. Recent exhibitions include a solo exhibition at the Christopher Cutts Gallery in April, 1998 and a national touring retrospective opening at the London Regional Gallery in September, 1998. Dierdre Hannah’s contribution to the third installment of visual poetry pays homage to the concrete poets of the 1970’s. Hannah continues to experiment in both published and performed poetry. Toronto-based Dierdre Hannah is a writer, poet, and Art Editor of NOW Magazine.